Note that this exclusive interview with GM Vassily Ivanchuk was taken one day before he became the Jermuk Grand Prix Champion. Congratulations GM Ivanchuk! The enigmatic and spectacular Vassily Ivanchuk was kind enough to grant an interview during the tournament, something he understandably prefers not to do. Lilit Mkrtchian sat down with the chess superstar over dinner, in a friendly atmosphere, accompanied by his second: IM Manuel Leon Hoyos. 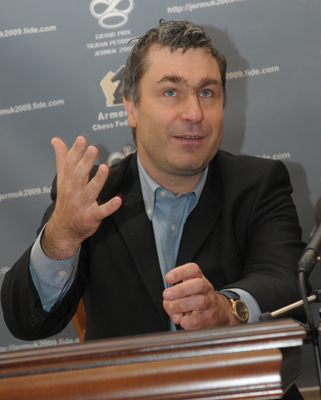 -GM Ivanchuk, how did start your cooperation with IM Hoyos? -It is an interesting story. I was invited to Mexico in 2007 to play in some simultaneous games and give lectures. And I thought I would go there, relax, enjoy my time and take it easy. I didn’t take even my computer. Meanwhile, the Morelia-Linares tournament was to be taking place at the same time. And if you remember, Radjabov refused to play at the last minute and the organizers invited me to take part in the tournament. I couldn’t reject such an offer, and frantically began searching for a second, someone who could be of help with computer analysis. As such, I started working with IM Hoyos and happily our cooperation has continued. He has accompanied me to several tournaments, and likewise he is here with me in Jermuk. Round thirteen was every bit as thrilling as expected, with several of the contenders playing well into the afternoon. After a series of draws in the games between Eljanov vs. Kasimdzhanov, Karjakin vs. Kamsky, Bacrot vs. Cheparinov, and Jakovenko vs. Alekseev, the crowd’s attention turned to those battles where the winner of Jermuk would be decided. Ivanchuk had equalized after the opening with the black pieces and was starting to press against Akopian. Aronian was expectedly starting to put the positional squeeze on Inarkiev, and Gelfand was launching an enterprising attack against Leko. As it turned out, Aronian converted in smooth style to guarantee himself a top place in the standings, waiting to see if his compatriot could hold off Ivanchuk, thus making it three first places out of three Grand Prix tournaments. 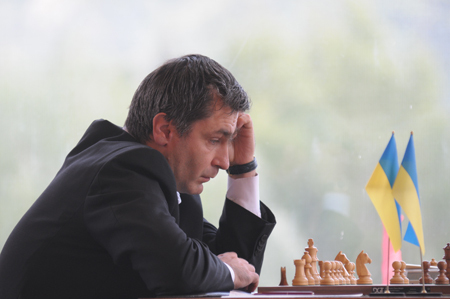 But Ivanchuk was not to be denied. The Ukrainian won a nice game and with it left his competitors in the rear-view mirror. A combination of great defense (the knight endgame against Inarkiev), and beautiful combinational execution (the gem against Alekseev), and a bit of good fortune (50 move rule saving the day against Kamsky) proved to be sufficient for Ivanchuk to emerge as sole winner of the Jermuk tournament. Meanwhile, Gelfand played a very nice game against Leko, overcoming the Hungarian’s excellent defensive prowess in attempting to fend off Gelfand’s inventive attack. This time it proved insufficient as Gelfand had just enough to win a bishop endgame with an extra pawn. With an impressive victory with the black pieces in his final round game, GM Vassily Ivanchuk scored an undefeated 8.5 out of 13 to win the Jermuk leg of the Grand Prix tournament dedicated to Tigran Petrosian, who was world champion from 1963 through 1969. Ivanchuk's games were exciting, long lasting, and unpredictable, often involving out-of-the-blue combinations, impressive protracted defensive stands, and most often his hallmark creativity. Sharing second and third places were Armenian GM and crowd favorite Levon Aronian and Boris Gelfand, each of whom won their final round games as well. Incidentally, with his joint second place finish, Aronian has already clinched first place in the overall Grand Prix cycle, which is doubly impressive, given the fact that there is still one leg left to be played, and that he has yet to play in his fourth tournament. Congratulations to Levon Aronian for his overall accomplishment in winning the Grand Prix series. Round report coming soon, but first of all a hearty congratulations to Vassily Ivanchuk, winner of the Jermuk Grand Prix! Rustam, you have come to Jermuk without a trainer, isn't it difficult to compete without a trainer? Of course it is very difficult to get ready for the match without a trainer, but on the other hand it is easier to be focused on chess alone. There are some tournaments in which I participate without a trainer, and in others I take a trainer, so it is very difficult to say in which case I’m more successful. Both cases have their advantages. And what about trips with your wife? Surely, it is much more pleasant when my wife is with me, but we have children and we don’t want to leave them alone for a long time. So that is the reason why we do not travel together very often: only once or twice a year.